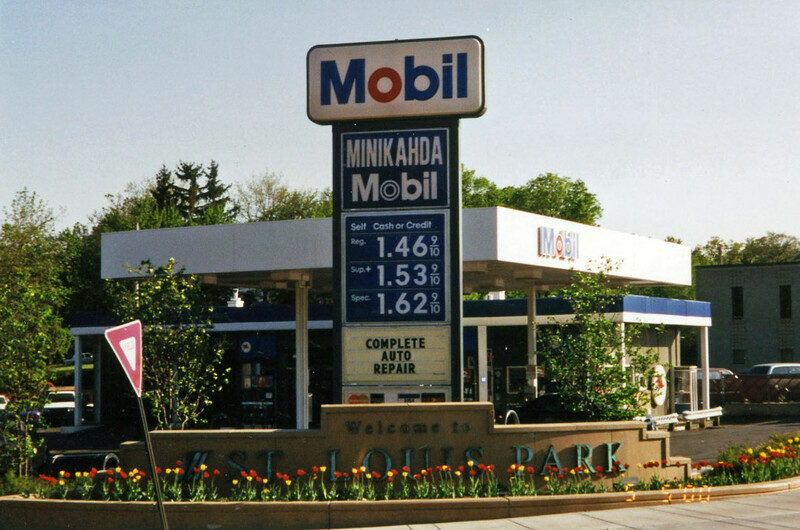 This site at France Ave. was famous as Sid Brown’s Pure Oil Station. The area was platted as block 15 of the Mendoza Park subdivision on April 24, 1891. It is the only section of Mendoza Park that exists today. A 1914 map shows this little triangle at the intersection of Excelsior Blvd. and France Ave. as a green space called Mendoza Park. The station probably dates back to 1926; on March 4, 1926, Mr. R. F. Grattan, representing Pure Oil, came to the Village Council and requested permission to erect a gasoline filling station on the SW corner of France and Excelsior. (The station shows up in a 1927 but not a 1926 business directory.) The 1928 directory indicates that Robert Johnson had a station at 3905 Excelsior, which is not a current address and might be this location. The man in the picture above is Sid Brown, who was associated with the station for many years. Sidney R. (Sid) Brown was hired by Pure Oil in 1931 to operate the station. In those days, the oil companies owned the stations and offered leases to run them. In 1913 Brown bought a house on Natchez and rented it out – he married and moved into the house in 1916. Brown had been a machinist at the Minneapolis Moline plant in Hopkins before being laid off in 1929. Sid was so popular that when he left the station in 1944 over a rent increase dispute, business dropped off and Pure Oil asked him several times to come back, which he did after working for Minneapolis Moline for about nine months. In those days, gas was less than 20 cents per gallon and all service was full service. Brown’s employees included Bill Burgess, who later ran the station on the Alabama Triangle, and Brown’s son Bob, who left to serve in the Korean War. Mostly he hired local high school boys. Sid worked at the station until 1951. Since he was considered self-employed and therefore ineligible for Social Security (a common problem among proprietors of businesses during that time), he worked at other stations from 1951-61. From 1946 to 1948, the station had a license for four pumps. 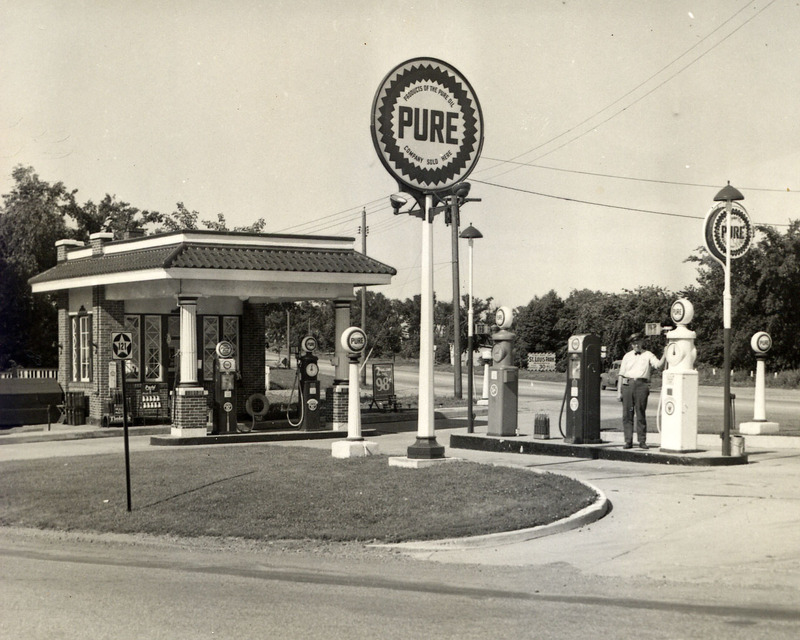 In 1950 Pure Oil remodeled the station and added two service bays to the east. It also took on the Pure Oil cottage roof and chimney, although it was still fronted with some (real or fake) stone. From 1952-54 John K. Martner ran Johnny’s Pure Oil Service. From 1956-60 it was Jack’s Pure Oil Service. 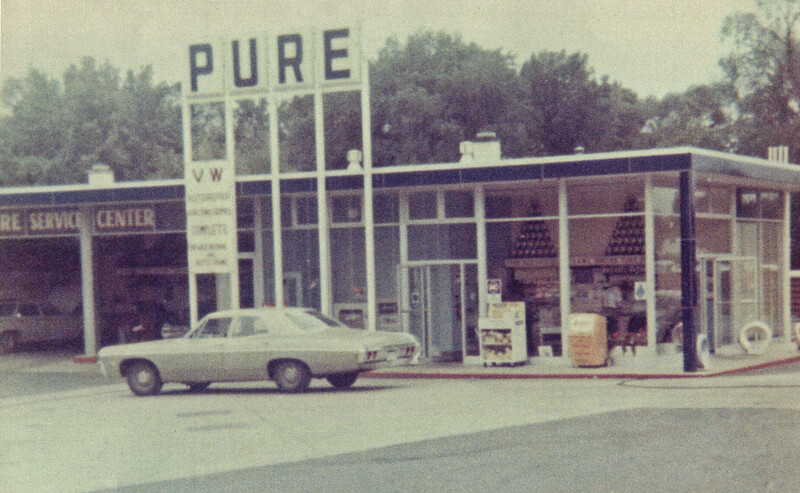 From 1962-69 it was Jim Maloney’s Pure Oil Station. Jim Maloney ran the station for many years with Tom Smith. 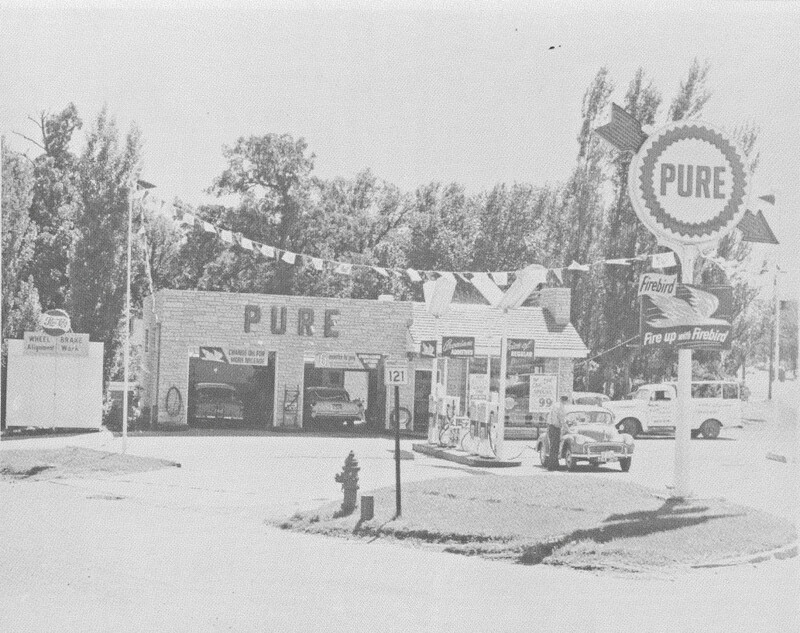 Pure Oil merged with Union Oil in 1965, but the stations continued to be operated as Pure Oil. In 1968 the building was razed and the current building was built on the site. The stone was replaced with glass all around and a third bay was added. 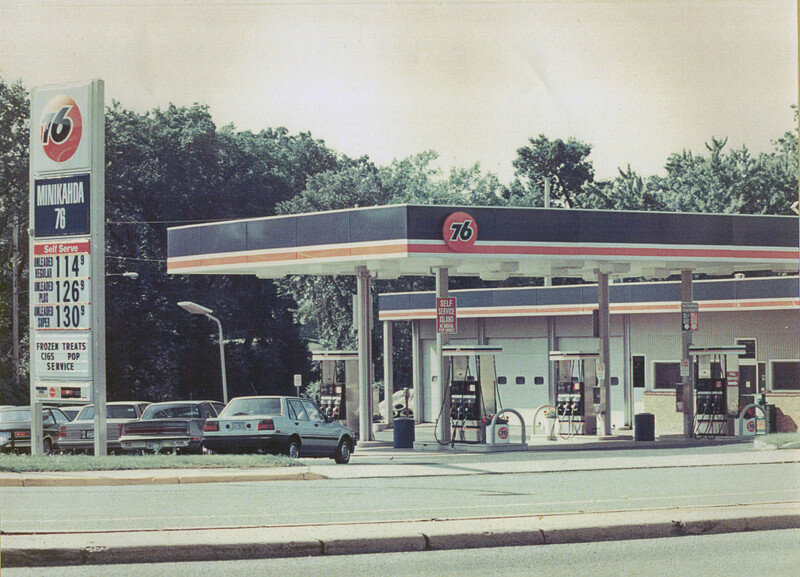 In 1970 all the Pure Oil stations were renamed Union 76. Below is a photo from 1970 just before the rebranding to Maloney Union 76, run by Jim Maloney and his brother-in-law, Lloyd “Doc” Dokter. Doc was a “VW Specialist,” servicing the Volkswagons in the area. Upon Doc’s retirement, Tom Smith bought into the business. In 1992 Union 76 took on its modern façade. The station then became Auto Motion.